Geoff Ralston, Y Combinator Partner, on increasing transparency in startup investing. I recently wrote some software at angelcalc.com1 which allows investors and founders to model a startup’s equity financing and determine how outstanding convertible securities convert into shares. It’s a modestly cool tool and I had fun writing it, but in doing so realized that there are several problems with how our current seed fundraising ecosystem works. My frankly ambitious goal here is to inject some much needed transparency into the system. Angelcalc will help, but it can’t do the job alone. To understand what else is needed some explanation is necessary. In many ways it is easier than ever for startup founders to raise seed financing, and it’s easier and more convenient than ever for angel (a.k.a seed) investors to find and choose where to place their bets. However, the speed and convenience has come at a certain cost. Nowadays the earliest investors in startups usually invest via convertible securities – most commonly safes. The moment when those securities convert - almost always when the startup raises a qualified2 equity round - is shrouded in mystery. It is exceedingly difficult for both founders and seed investors to figure out what has happened; millions of new shares are issued, new investor rights are defined, and previous rights changed or eliminated. Shareholder rights in an equity financing are generally negotiated between the venture capitalist(s) doing the deal and the startup founders. The lawyers working on the financing then memorialize those rights in several documents and calculate everyone’s ownership in the company post-financing, starting from the company’s existing capitalization table3. Angel investors almost never have a seat at the table while all of this takes place. This means there is no guarantee that rights they gained in their financing are preserved. My YC partner Aaron Harris has pointed out this pattern in the case of pro rata rights4. It is probably true that in most every case small investors simply go along with the terms negotiated by others irrespective of whether their rights are being egregiously trampled upon. Still, investors have the right, at minimum, to expect notice of any such changes. When a financing as described above is nearly complete, seed investors are sent the financing documents to sign, and often asked to do so with little time for review. Sometimes, but not always, the investors are also sent a pro forma5 cap table as an Excel spreadsheet. The only way for those investors to know exactly what has transpired during those negotiations is to carefully read - or have a lawyer read - all of those documents and to dig into the Excel file to figure out how share prices were determined. Practically speaking, in almost every case early investors, especially angels, simply shrug their shoulders, sign, and take what they get. A summary pro forma cap table summary with sufficient information for an angelcalc or, for that matter, an Excel model. Note for the investor: This is not a legal document, but merely a summary. The rights described above will be explicitly described in the Stock Purchase and/or other agreements for this deal. 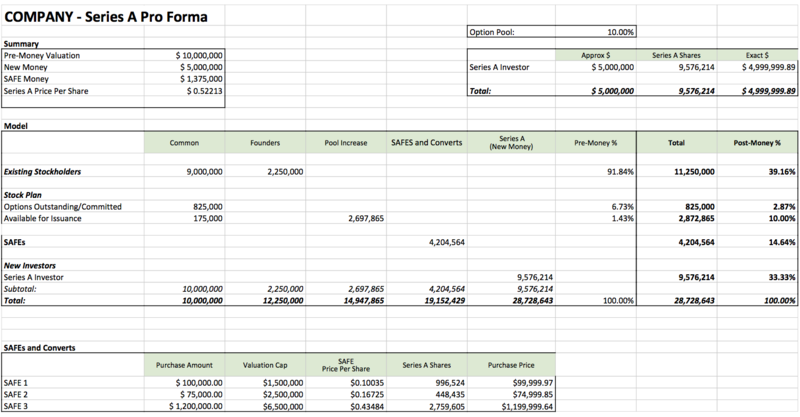 The second part is a simplified pro forma post financing cap table. This cap table contains all the information needed to model your conversion using angelcalc.com or Excel. It contains none of the most sensitive, individual ownership information contained in the complete pro forma, which is almost never needed by investors. My hope is that eventually distribution of this two page summary will become standard among founders, VCs, and their lawyers upon the completion of a deal. At Y Combinator we will ask our founders to make sure it happens in their deals. We have had considerable success in moving the industry towards simple, transparent standards such as the safe. I think we can do it again here but it will help if angel investors start demanding this sort of summary when they are notified of conversions. Why might folks choose not to take up these recommendations? The most obvious reason is that it will be too time consuming and expensive - lawyers will have to spend time and therefore money generating these documents. However, this argument is specious. I have worked with legal teams to estimate the costs involved, and the summary pro forma will take about an hour to generate and error-check and each individual angel summary may be generated by a macro from the Excel pro forma and then completed / filled in / error checked. At most this should take about another hour of paralegal time depending on the number of investors. This might even save time, since investors will likely respond with fewer questions. Transparency in startup financing will benefit everyone involved. Large investors should be happy because deals can get closed more quickly as seed investors, given this information, rapidly sign their docs. Founders will have treated their earliest supporters right, and those investors will, for once, understand clearly how their securities converted. There is a bigger story here regarding the world of startup investing and this post about the first equity round is not the end of that story. But it is a good place to start.